A favorite game show has been resurrected yet once again, “$100,000 Pyramid”. This time by ABC network hosted by “Good Morning America” host Michael Strahan filmed at ABC studios in New York. The popular game show has been done many times before with a smaller pot of loot at the end of the Winner’s Circle to be won. Both GSN (Game Show Network) and CBS gave their best stabs at it. PYRAMID Enters the 21st Century! This time around, it looks like ABC has got it right by following the simple and traditional game play with entertaining celebrity guests and a charming, entertaining and interactive host. 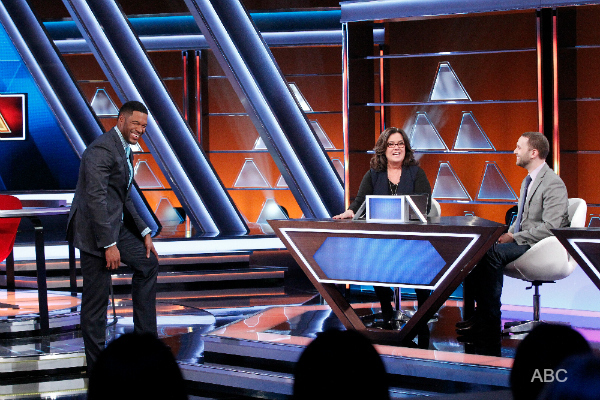 The celebrity guests to the first half-hour episode were Sherri Shepherd, and Anthony Anderson (“Black’ish”). Anderson joked that he’s now become a Michael Strahan impersonator because people confuse him for the well-known host. The show has an easy and perfectly paced flow to it. Each player gets two rounds at getting a shot at beating their opponent at the first six category Pyramid before possibly moving on to the Winner’s Circle where they play to take home $50,000. If the contestants wins the the Winner’s Circle in the first round, they get the second round to try to make it back to the “Winner’s Circle” where they have a shot at winning $100,000! If they get stuck on any of the clues, they can pass. Either way, they keep the money that they play for in the first round based on the answers they get right. Keeping to tradition, the player in the “Winner’s Circle” round who is giving the clues must strap down their hands before they start to play. In this round, they are not allowed to use hand gestures while giving clues. 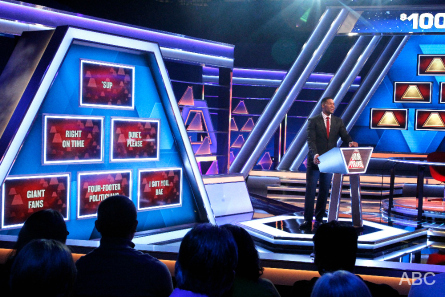 The first pyramid consists of six categories where contestants have to answer as many of the seven clues correct to each category as much as possible. If a player gives part of the word answer in their clue, that clue gets thrown out. For instance, the clue giver can not say “waiter” if the answer is “waitress,” or say “end” if the answer is “weekend”. Should a tie occur, it’s the team that scored their points in the least amount of time that wins that round an moves on to the “Winner’s Circle.” In the first episode, the winning team of the tie-breaker won by half a second. After the the Winner’s Circle round, the same players come back for a second round. However, the contestants swap celebrity partners. This can be a good or bad thing for the contestants depending on if they end-up with a weaker playing celeb contestant. In the second round of the first Pyramid, players have a chance to win a prize that is a hidden sub category beneath one of the six categories. It’s called “Mystery 7”. The contestant that scores this “Mystery 7” category must answer ALL seven clues correctly in order to win the prize. In the case of episode one, the prize was a trip on Disney cruise lines to the Bahamas. Host Strahan can not tell the contestant what the unifying theme of the “Mystery 7” category is because it’s a mystery. One of the Mystery 7 categories ended-up being “people who wear capes” where some of the answers included: Elton John, Elvis, Dracula, Batman. In episode one, Sherri Shepherd played with contestant Derek who both had a good knack for playing the game. Anthony Anderson played with Lori. Anderson wasn’t as good at giving clues as his competitor Shepherd. They had fun with their friendly rivalry. When the time came to switch celebrity partners, not so fun. Derek got stuck with the weaker Anderson and he was not having as much fun. 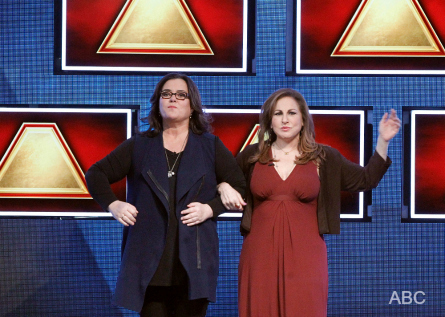 In the last portion of the second six Pyramid round, the players get to choose who will give the clues. When Anderson tried to proclaim himself as the clue giver for that round, Derek aggressively grabbed the clue screen from him and said he was doing it. Strahan laughed and said he thought Derek made the right call for sure. Some examples of some of the first Pyramid six categories were: “A Cry For Yelp”, “Boy Toy”, “Walk-on Parts”, and “The Whirl Series”. The theme for “Boy Toy” was male characters that are popular toys. Two of the answers were Ken, and Mr. Potato Head. O’Donnell had fun with a category called “Make America Grate Again”. The theme was “describe these foods that might have cheese.” O’Donnell yelled “Donald Trump!”. Seriously, some of the answers included: hamburger, pizza, omelette. Another category was: “Yezzy Does It” which was “people that Kanye West has compared himself to. The answers included: Martin Luther King, Jesus, and Shakespeare. Strahan got broken-in as an official game show host when he got super embarrassed and shocked by what a contestant said. To avoid spoiling the surprise, we’ll just give the clue that it included the word “Viagra”. 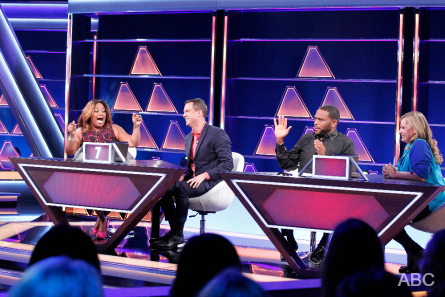 ABC’s “$100,000 Pyramid” premieres Sunday, June 26th, 9-10 pm ET.